Our yard is alive with butterflies at this time of year. We have daily visits from Checkered Whites, Queens, Western Blue Pygmys, Fiery Skippers, Orange Sulphurs, and others. 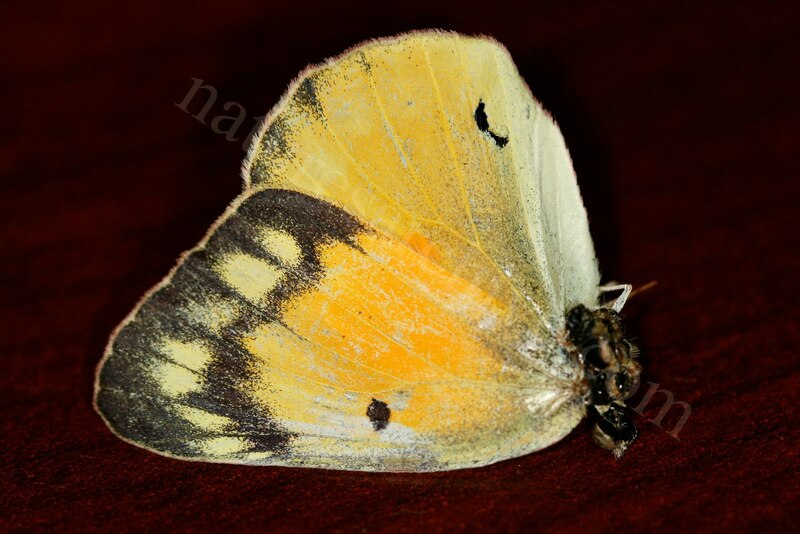 In fact, the other evening I noticed half of an Orange Sulphur (Colias eurytheme) laying on the ground in our backyard. It had obviously died recently, and the ants were starting to perform their "clean-up" chores. But not wanting to pass up an opportunity for inspection, I brushed the ants off and took the butterfly inside for a few photos. With my 2 year old knocking at the door wanting to see what I was doing, I was a bit rushed in snapping off a couple of shots. With my macro lens, depth of focus was quite shallow, but I tried to align the plane of the butterfly wings with that of the lens. The result was pretty good detail even when viewed at 100%. Click on the photo to get a larger view, and you can get a good look at the wing structure. Orange sulphurs are very common butterflies across much of the United States. Are medium-small (2 - 2.5 inches wing tip to wing tip when fully open), and are erratic fliers. They typically do not look as colorful as the above since they are typically seen with their wings closed, which presents a dull yellow color.